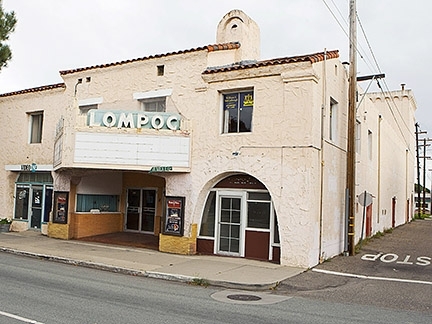 The Lompoc Theatre Project (LTP) announced several renovations as part of the restoration of the historic Lompoc Theatre, including the removal of all asbestos from the theater’s lobby and auditorium. The theater’s leaking roof has also been temporarily sealed with a specialized tarp that will prevent further rain damage. Once all hazardous substances have been removed from the interior, the LTP plans to open the theater’s doors and allow the community to see the progress, Herrier said in the release. Herrier noted that the LTP was able to undertake the restoration project due to a generous donation from actress Julie Louis Dreyfus and her husband, Brad Hall. Herrier also announced the hiring of the LTP’s new general manager, David Ramsey. Ramsey’s contracting experience ranges from remodels of estate homes, hotels, and restaurants, such as Root 246 in Solvang. More information about the Lompoc Theatre Project is available at 451-0952 or lompoctheatre.org.